I wonder when the day will come that I am not totally swayed by the J. Crew lifestyle. The styling of their presentations, catalog, web site and stores is so cohesive, so addicting - that I wonder if spending too much time around it is like sartorial crack. On the top row, we have killer (and I mean killer) coats. Prints, texture, structure and style - it's all there. 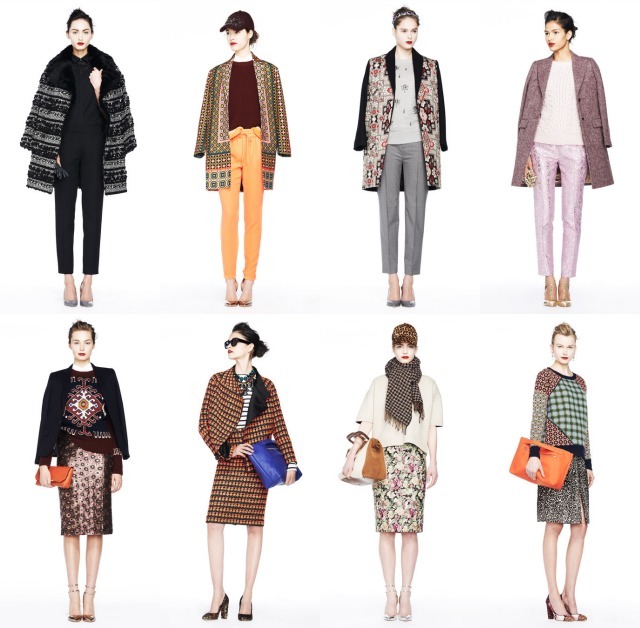 I'm particularly drawn to the second coat from the left - the bright geometric print. Due to fashion week street style I've become ever more obsessed with statement coats - and it seems like now is the time to get one of my own. On the bottome row, skirts. Oh, pencil skirts. I had my first encounter with a J. Crew pencil skirt during fashion week last season, and I love these printed iterations, paired with heels, caps and fantastic sweaters. Looks to me like if J. Crew has anything to say about it, we're in for quite the colorful fall. I urge you to head over to style.com and swoon over the whole collection. I need all of these. Every single one. I loved everything from the embellished coats to the color. Looks like it's gonna be a colorful fall. agreed. never not obsessed with their looks!! !